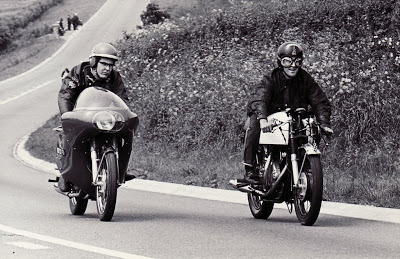 And all the classic Rocker gear is represented; the Goldies, Bonnies, Dommis, dustbin fairings, even a Norvin, and at the end, a couple of Japanese lightweights…. There was always a bit of real racing to inspire the ‘go faster’ look of the Rocker boys; these shots (above and below) of a racing Dominator 88 were taken at Mallory Park. A very tasty machine indeed, and worthy of imitation. 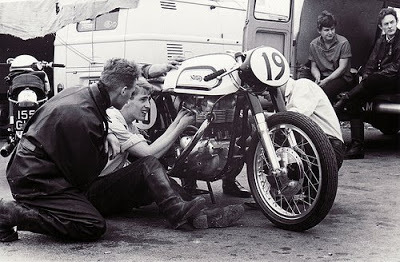 There was always a bit of real racing to inspire the ‘go faster’ look of the Rocker boys; these shots of a racing Norton Dominator 88 were taken at Mallory Park. A very tasty machine indeed, and worthy of imitation. 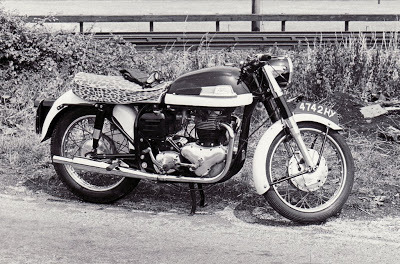 Nothing will make your Norton Dominator 99 go faster than a leopard seat cover and Goldie muffler! 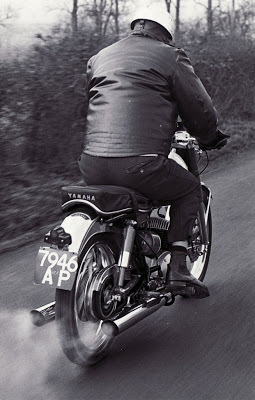 The two-in-one exhaust was an optional extra from Norton, and the flat ‘bars are standard. 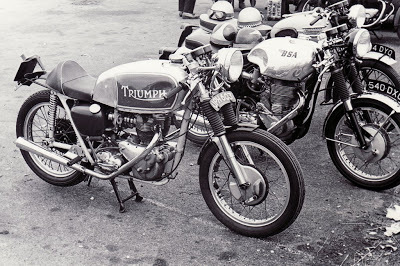 It was sporty to begin with… you can tell it’s an early ’60/’61 model by the two-tone paint job (standard) and the Norton ‘button’ on the timing cover – of course it’s a Slimline Featherbed frame as well. 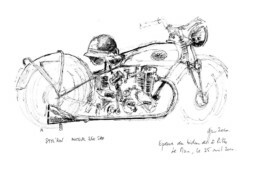 …it will find a bump in the road and lift the rear wheel off the deck, pitching itself and the rider off the road completely. This machine is an early Wideline Norton, can’t tell if it’s a single or twin-cylinder, but it has the ’58/’59 type chrome panel on the petrol tank; the ‘ace’ bars have Doherty alloy levers, very racy, and the rear valanced mudguard has had the removeable rear section… removed! Much of it would have needed repair after this getoff, but it seems the rider never had to bother, as the notation says “he survived this spill but wasnt’ so luckly later when he died on his way back from London on this bike…”. 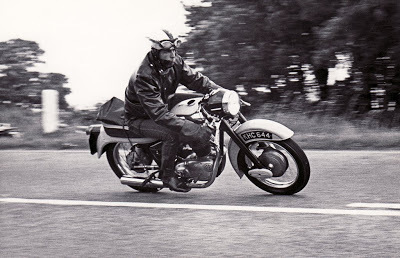 Not all Nortons were Dominators, Atlases, or Internationals; this is the only photo I’ve ever seen of a café racer Norton Navigator! 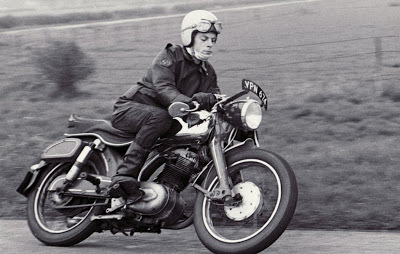 The 350cc little twin was never a great performer, and certainly didn’t live up to the hotrod reputation of it’s bigger brothers. I’ve owned four of them (don’t ask), and the timing chest sounded like a cast iron stove being run over cobblestones… not Norton’s best effort. But, they are compact and tidy looking, and share forks and wheels with the big twins. …of an attempt to lighten and sportify what was already a very good machine. The pukka racing NSU Sportmax is one of most beautiful motorcycles of all time, but this impecunious young owner could only manage to lose the front mudguard and add ‘ace’ handlebars… improvement or desecration? Regarding clip-ons; for the seriously racy crouch, the rule was, ‘the lower the better’ – just above the lower fork clamp seems to have been the goal. 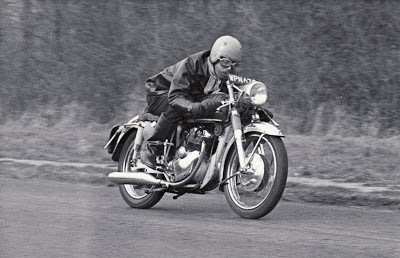 Inspired by racing practice, it became Fashion, and actual utility was left out of the equation…no racer had clip-ons that low! The fellow on the second machine has inverted some fairly high handlebars to really get down to it. 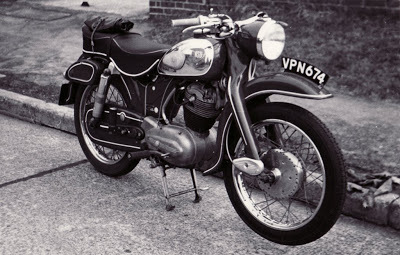 Here’s another rarity; a Royal Enfield Super 5, their sportiest 250 in 1962/3, with short leading-link forks, 5 speeds, and a 20hp engine, giving about 84mph top whack. This is a ’62 model with deeply valanced front mudguard – amazingly the bike is completely standard, with ‘ace’ bars as per catalogue spec. R.E. 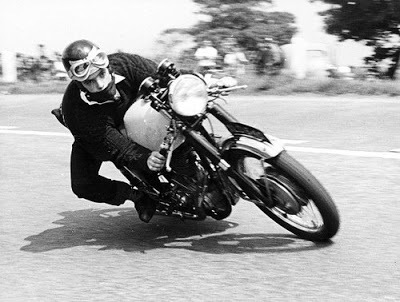 had a clue; in 1964 they introduced a factory-built café racer – the Continental GT. 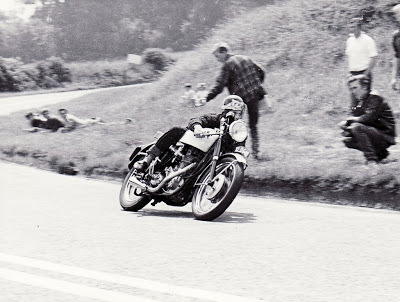 … it was completed, and our lad can be seen ‘hanging off’ at the notorious bend which ate the Norton in the earlier photo.. Note the spectators lurking on the outside of the bend – the Rockers must have been the best thing going on a sunny weekend day, and this was the corner worth watching! Another corner worth watching; here a BSA Gold Star tears around the bend, while the fellow in the plaid jacket records the proceedings on his portable tape player! I can hear it now – the classic Gold Star muffler has been replaced with a short megaphone (actually a factory racing item), and it was LOUD. The rider is very well tucked away and leaning a lá Phil Read into the bend. Nice technique. Another shot of our B.S.A. Gold Star hotrod, with clip-ons a bit lower than the Factory set them…the tank is patterned on the ‘Lyta’ large-capacity racing item, although this looks like a fiberglass copy – much cheaper, and money was certainly tight in the 1960’s. 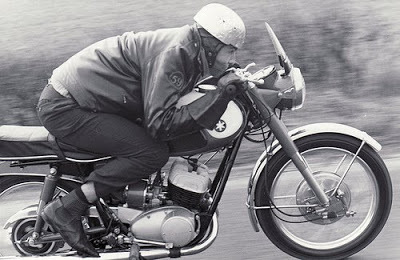 Phil Read had only recently introduced the ‘knee hang’ on GP circuits; it would be many years before racers would hang completely off the seat. The lad had great style – what a terrific shot! “Into every ride a little Trouble must fall”… and if you’ve ditched your center stand for more ground clearance, a kerb is a handy thing. 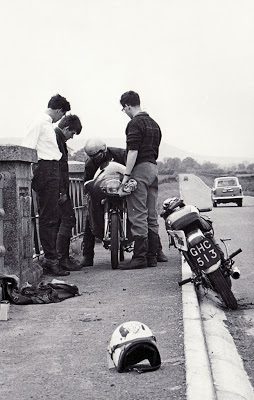 Even a Learner could ride a hot Royal Enfield Clipper 250cc, as this fellow has, while waiting for his pal on the Norton with Peel fairing to sort out his issue. 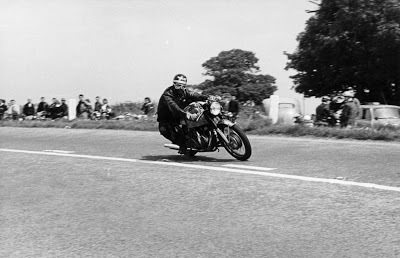 Note the four-wheeled competition driving away; truly, motorcycles ruled the road in the 1960s in England. 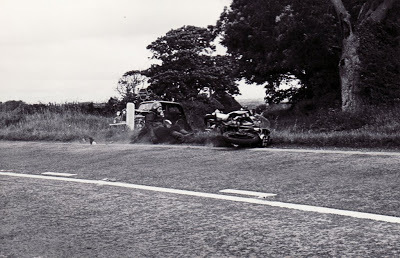 That little Hillman saloon would be hard pressed to make 70mph, and certainly wouldn’t get there quickly. 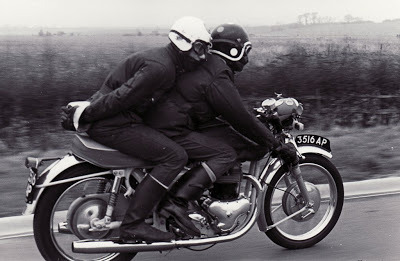 And if you’ve got a bike, and your mate’s is down, give the lad a ride…no holding onto the rider though! 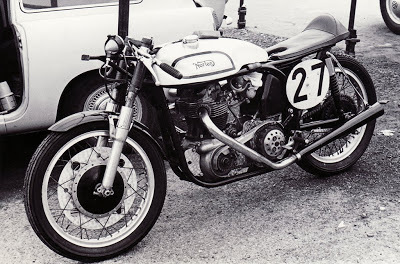 A very nice Norton Domi 88 or 99, with optional tachometer, but driven from where? Perhaps it’s just for show – I only see one cable – or maybe it’s an 8-day clock! And then, the Trojan horses appeared…so unassuming in thes early days, and so small. 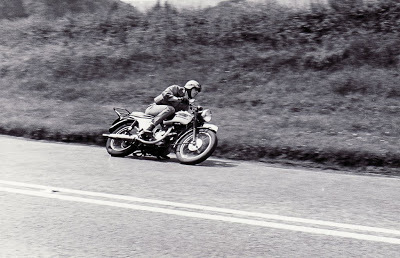 While the 125cc SOHC Honda CB92 Benly had tremendous performance for its capacity, it was still only a 125… and if the rider was a big bloke, it would take a while to achieve the 70mph max – no passing Hillmans then. 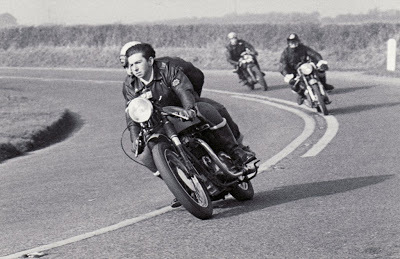 Note the fellow’s ’59’ Club patch; Father ‘Bill’ Shergold’s club for motorcyclists, and you had to visit his church in Hackney Wick, London, to get a patch. 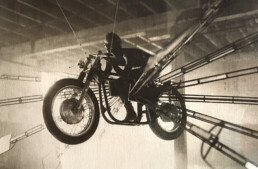 It was the largest motorcycle club in the world during the 1960s. 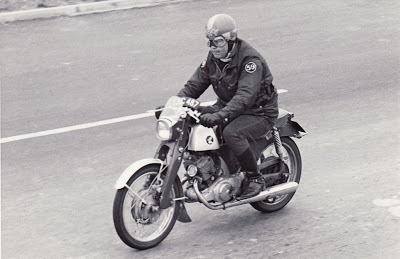 By the time this Yamaha YDS1 250cc two-stroke twin appeared, all bets were off, and Honda had already won a string of TT victories. Yamaha and Suzuki were pressing hard on the Isle of Man as well as on the GP circuits, scoring victories over their exotic DOHC counterparts from Italy and Germany. Britain had long before given up a credible threat in GP racing. 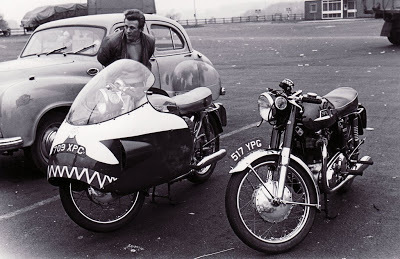 Very nice pics, the navigator racer superb, ans also Norton 88 and 99, my actual racing bike! Many thanks for this fabulous post! Great post, Paul. I’d like to see even more of the “lifestyle” and people shots that Manktelow did. It’s always as interesting as the machinery! BTW, my first bike was one of those Yam YDS’s. Mine was a ’65 YDS-3, 305cc , a Calif.-only model. In ’68-’69 people were surprised how quick the little things were. smell the smoke and hear that particular “Ring-a-Ding”sound ! Wow as always great photos! 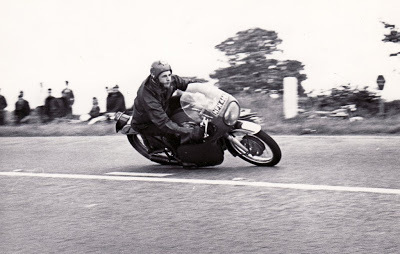 I think it’s worth mentioning that in 1961, Honda shall we say “broke on through to the other side” with Englishman Mike Hailwood at the helm taking first in the 125, 250, 350, and 500 cc Isle of Man. It must have been a chilling and sobering message to the British motorcycle empire. Below is a link to hear the venomous sound of a Honda 250/6. God Speed. confine things to “Made in England,” how about Honda’s delicious GB 500 TT, though it’s really intended as a 7R homage more than anything else. Or, sticking with things British, how about the G50CSR, aka the Matchless Golden Eagle, even if only a handful were produced and all, apparently, were sent to the States? Am I missing something you’re thinking of on the Triumph end (Meriden, not Hinckley)? Lots of friends turned their Daytonas and Bonnies over to cafe-racer specs, but those, I suspect, don’t qualify. So, please, come clean, after the Conti and the Thruxton, what are you thinking of? Jim, I didn’t exclude the Gold Star just because it was in the post – so that and the Velo Thruxton are in my humble opinion the only other proper Cafe Racers produced for general sale, with the Connie GT – clip-ons, rearsets, alloy rims, big GP carb, fast, mildly anti-social, totally desireable then and now. You win! Other bikes came close, but didn’t have all the right bits, even if you could add/order them. I was thinking about defining the average cafe racer, and why so many late comers and overseas people misunderstand the genre. Here’s my first guess, it was about education. 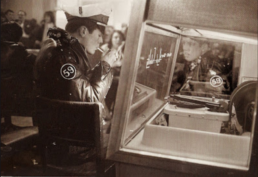 At the time mid-Fifties to late Sixties, if you failed or passed the eleven plus exams more or less decided your career, class, steam for life, taken at eleven years of age. It put you in one of two streams – fail secondary modern, pass grammar school; second mod meant you were factory fodder, pass you went to grammar school – a direct lead into university , but here’s the catch – secondary modern means you could get an apprenticeship, five years. At the time part of the apprenticeship was one week a month at a technical college on full pay – thank you Labour Party – so when you came out of the apprenticeship tunnel, you had four years of work and one of technical college. The grammar school grads were driving BMWs, but could not fix them! What a unique set of high quality photographs. Wouldn’t it be great if they were issued in book form. Is Mr. Manktelow still with us? Could you tell us some more about his life? That Goldie with the alloy tank, looks very similar to the one owned by ‘Mad Johnny’ (John Davine). I was a member of the Johnson’s Motorcycle Club- out by Brands Hatch, from ’65-’67, and had many friends among the guys who hung out there! Thanks again, for taking me back! Your father’s photos are some of the greatest capturing fully an element of life from that now bygone era. He must be truly applauded for his skill and quality of his photos for that time. Thank you so much for sharing them.